HCM City (VNA) – Aquatic product exporters should devise proper strategies to make inroads into to China – a potential but choosy market, experts said at a workshop held in Ho Chi Minh City on August 30. To export aquatic products to the market, businesses must be on the list of manufacturers recognised by Chinese authorities and their products must receive the host’s quality certificates, said Dang Ngoc Sam Thuong, Supply Chain Manager at Amanda Foods Vietnam. 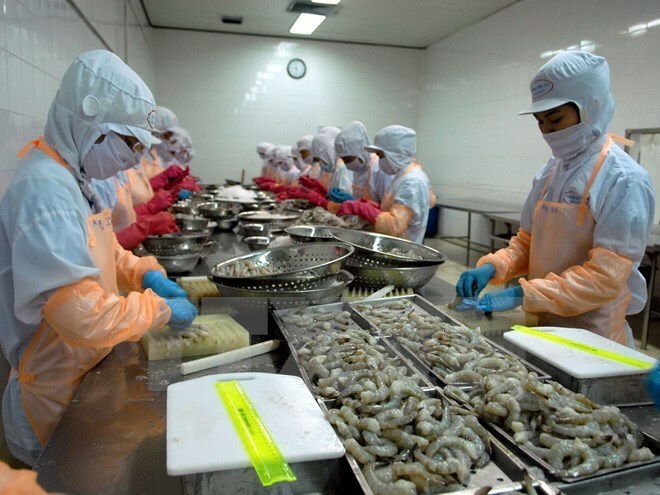 Tran Van Linh, Chairman of the Thuan Phuoc Seafood Joint Stock Company in the central coastal city of Da Nang, China is likely to become the largest shrimp importer of Vietnam in the future. According to deputy director of the Vietnam Association of Seafood Exporters and Producers (VASEP)’s Training and Trade Promotion Centre Le Hang, Vietnam’s aquatic product export to China continued to grow through years from 152 million USD in 2007 to 860 million USD in 2016 with strong growth recorded in shrimp and tra fish exports. Deputy head of the Foreign Trade Department under the Ministry of Industry and Trade Nguyen Phu Hoa said Chinese customers prefer high-quality products. Therefore, businesses need effective strategies to develop their brand names, thus promoting exports to this market, he suggested. Yang Yong, Chairman of the managing board of the Guangzhou Nutriera Biotechnology Co., Ltd. said Chinese consumers are willing to pay 20-30 percent higher than normal for imported products with high quality, safety and convenience. Vietnam shipped 749 million USD worth of aquatic products abroad in August, bringing the total in the first eight months of 2017 to 5.13 billion USD, up 18.1 percent from the same period last year.